Eurosceptics often complain that migrants are taking British jobs and bringing down wages, especially in the low-skills sector. But the real threat isn’t from migrants – it’s from machines and robots that are predicted to replace half of all British jobs within twenty years. Yes, 15 million jobs in Britain lost to robotics in most of our lifetimes, according to the Bank of England’s Chief Economist, Andy Haldane. It’s nothing new. I’ve been warning and writing about this for years. Don’t think Romanians should pick our strawberries? Just wait ‘til robots get their gleaming mechanical mitts on them, working 24 hours a day, 7 days a week, at a mere fraction of the minimum wage, and never needing holidays or sick pay. And it’s not just unskilled jobs at risk. Accountants have an almost 100% chance of being replaced by clever robots in suits – meaning their days are truly numbered. But according to the Bank of England’s Chief Economist (human, for now), it’s the low-paid jobs that are most vulnerable to replacement by electronics. A report this month by Bank of America predicted that UK employees currently earning £30,000 a year or less were five times more likely to be replaced by artificial intelligence than those earning over £100,000 a year. Another recent study by the Massachusetts Institute of Technology showed that robot bar staff were more efficient and less partial than humans. (Although the study didn’t calculate whether robots could handle their drink any better than people). 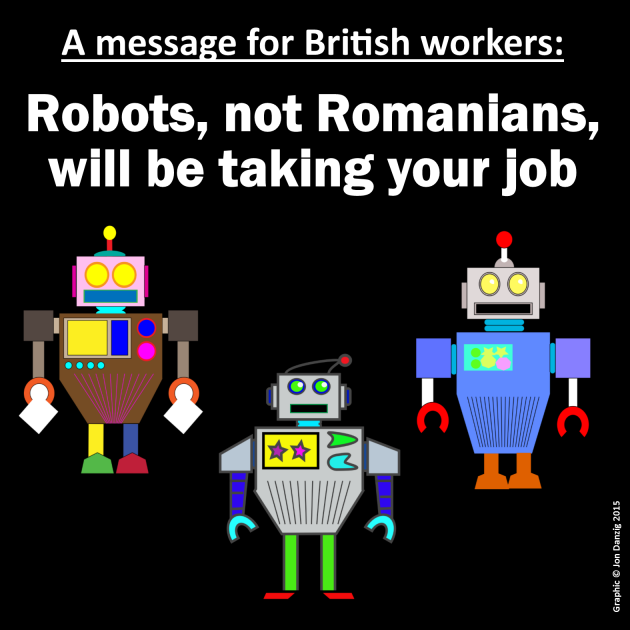 If half of all British jobs can be replaced by robots within 20 years, it’s my prediction that most jobs currently done by humans (British or foreign) will at some stage in the future be done by artificial equivalents. This isn’t a pipe dream (or nightmare). It’s a reality, slowly and insidiously taking place increasingly year on year. And never mind half of all jobs within twenty years. Boston Consulting Group predicts that a quarter of all jobs will be replaced by computers and robots within ten years. That’s soon. The current debate on the impact of migration will surely pale into insignificance compared to the imminent and increasing replacement of human workers with digital ones. That’s the issue that no politicians seem to be addressing, even though most humans at some stage in the future will likely face redundancy because of automation. What will humans do when there’s no work to be done? On the one hand, it could herald a new golden age of human leisure and blissfulness, with all dangerous, laborious and boring jobs delegated to a new led-flashing automated labour force that will become our servants and life-helpers. On the other hand, the loss of purposeful job roles for humans could see us enter an era of massive unemployment and wistfulness, with only the wealthy owners of robots having enriched lives, and the rest subordinated to becoming the bored slaves, and not the masters, of the new robotic age. Of course, the answer will come through politics, because it’s only politics that will decide how the ‘brave new world’ will function and who will, or will not, benefit from it. (Those who claim politics doesn’t interest or affect them won’t win that argument with a robot). 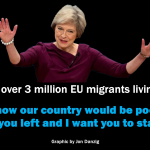 Worried about the numbers of migrants? Concerned whether Britain should stay a member of the European Union? All side-issues compared to the fundamental question of what should be the role of humans when humans may have no role. This is surely an issue we should be earnestly discussing now, and not when tomorrow’s world arrives, by which time it will be too late..
We are chemistry, so do humans have free will? 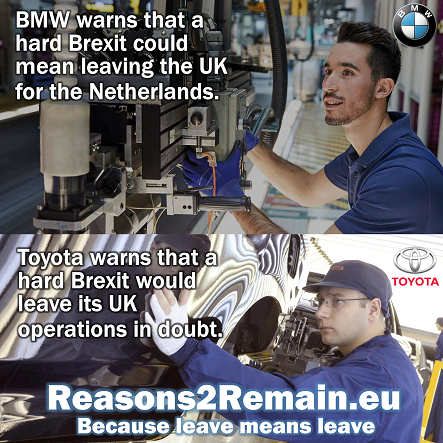 This entry was posted in Current Affairs, Economics & Trade, Education, Media & Communications, Politics & Public Policy, Society & Culture, Teaching & Learning, The EU and tagged automation, humanity, immigration, Luddites, machines, migrants, robotics, robots, unemployment. Bookmark the permalink. 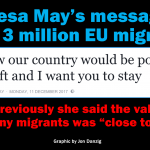 Previous: Does the Prime Minister know what he’s doing? Next: Britain is leaving the EU, says Daily Express. Really?